A two-alarm fire that broke out at a Chinatown building Friday morning displaced 25 people, a fire spokesman said Saturday. The blaze was first reported at about 7:45 a.m. at 1199 Stockton St., according to fire spokesman Jonathan Baxter. The building is a two-story building with several businesses on the first floor and 28 residential units on the second floor, many of which are single room occupancies, Baxter said. The victims are being assisted by both the American Red Cross and the Salvation Army. "Keeping this community close to its home is so important for their recovery in this incident," Director for the Salvation Army's Emergency Disaster Services John McKnight said in a statement. The victims, most of whom are senior citizens, are currently staying at the Salvation Army's Chinatown Corps, located at 1450 Powell St., Salvation Army officials said. "Following the closure of the shelter, we will continue to support these folks as we know recovery will take time," McKnight said in the statement. A temporary evacuation shelter was initially set up Friday at the Betty Ong Recreation Center, at 1199 Mason St. Additionally, Mayor Ed Lee's office sent Mandarin and Cantonese translators to assist the victims. Lee himself also visited with the victims and thanked all the first responders for their work. In addition to the displaced victims, seven businesses on the first floor were also affected. Those businesses are being helped by the city's Office of Economic and Workforce Development. "It's important that San Francisco small businesses know that the city is here to help when they face unforeseen events," Lee said in a statement. 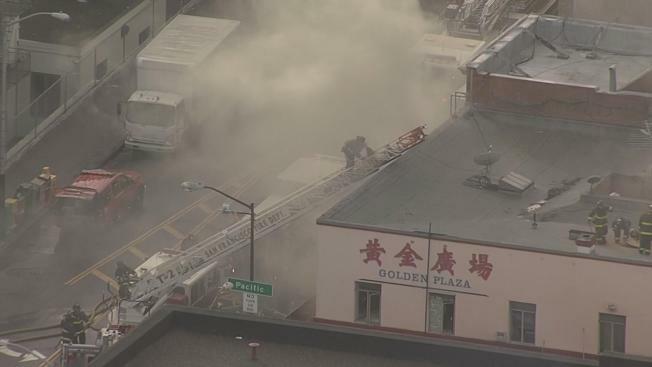 "Through the Small Business Disaster Fund, the small businesses impacted by the fire in Chinatown will get the resources and assistance they need to recover quickly and resume operations." One man suffered minor smoke inhalation during the incident, however he was not hospitalized. No other injuries were reported, Baxter said. Firefighters took about six hours to contain the fire. A large majority of the fire was located in the building's basement, according to Baxter. Firefighters were able to prevent the blaze from spreading to neighboring buildings. A cause of the fire has not been determined and an investigation into the incident could take some time, Baxter said.